What is an American Indian Horse? Fernando and his friend Tommi. Thank you Tommi for sharing Ferdie's story. Fernando was born in the West Texas town of Monahan, bred by Las Remudas Ranch when Buddy Ice and his wife Wanda had Choctaw Sun Dance on leave from us at Karma Farms. “Ferdie” is out of Margerita, one of two well-known daughters of Broom and Pie. 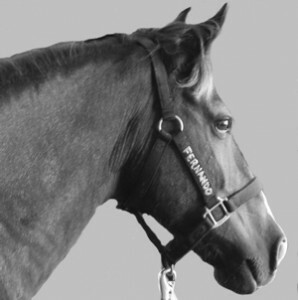 Margerita and her full sister Dainty Bess have produced numerous champions, but Ferdie is undoubtedly her best known foal. Today he is the Most Decorated Colonial Spanish Horse in the World. But what most folks don’t know about him is the rough start he got. Ferdie was born the same year Wanda Ice was going down hill with emphysema. She was in and out of the hospital, and Buddy—who used to spend his days out with the horses—now spent them at his dying wife’s side. While lying on her death bed, Wanda asked that if Buddy could no longer care for the horses without her, she asked that the horses go to Vickie Ives of Karma Farms. After she passed away, Buddy honored her wishes, and Karma Farms inherited 47 head of wonderful mostly Brislawn foundation bred horses from of the Horse of the Americas foundation herd. One of them was a little black yearling with a big star and snip by Choctaw Sun Dance out of Margerita. Unfortunately, while Wanda’s health had declined, so had the condition of the Ice horses. The hired help who were supposed to be taking care of the horses during a horrible and terrible time in the Ices’ lives weren’t, knowing Buddy wasn’t going to be there to check on them. Very few horses reflected the neglect more than the band of yearlings that included Ferdie who was too small and in need of deworming and with a case of popping stifles. Both back legs would lock up behind him, making it questionable rather he would ever be able to carry weight. But one should never doubt the strength of a Spanish pony. Ferdie grew out of the worst of it, and at 4 years old was ready to ride. Enter a somewhat shy and scraggly 10 year old girl: myself, Tommi, who had been watching the teenagers working for us at the time learning to break horses all summer. I eventually worked up the courage to ask Mom (Vickie) if I could help break the horses, too. A few days later she brought me outside and introduced me to Ferdie, tied in the round pen with a saddle on his back. That was the first time I rode The Little Black Horse, and the first time he was ridden. I’m sure we both knew our lives were changing that day, but there is no way we could have had any idea about the impact we would have on each other. Fast forward, Ferdie has been under saddle for a few months and will do anything I ask of him. I can ride him all over East Texas—and do—and he’s more than eager to go, ready to see new sights and learn new skills. He was fast, tough, and willing. I couldn’t have been prouder: the first horse I ever broke and anyone could do anything with him. Mom had told me he was for sale, and that I got a cut of the money once he found a good home, so I peddled him to anyone who showed up looking for a good riding horse. And then, just as everything was going good, something horrible happened. Okay, yes, selling a horse that is, in fact, for sale is usually the desired result, but I had no idea how attached I’d gotten to the little guy. The night after I turned him over to his new owner, who’d bought him for her grandkids, I cried all night long. Apparently, the feeling was mutual: Ferdie’s new owner Peggy had left him overnight in a stall, and when she went back the next day to take him home, she said he nickered. She said he wasn’t talking to her, though—he was looking for me. The moment they unloaded Ferdie from Peggy’s trailer, I was on his back and hugging his neck. He was happy to see me, too. We played like that for a while, and I told Mom that Ferdie was never leaving again unless I went with him next time. “Tommi, that horse can never do distance,” she said. Because even though he’d outgrown the popping stifles, he still had problems in the back end and was often very weak. She didn’t think he could carry even my weight for the 15-20 miles of a Novice ride in NATRC, much less a 20-30 Open ride. She begged me to pick another horse, any other horse we had, just not Ferdie. But I knew better. 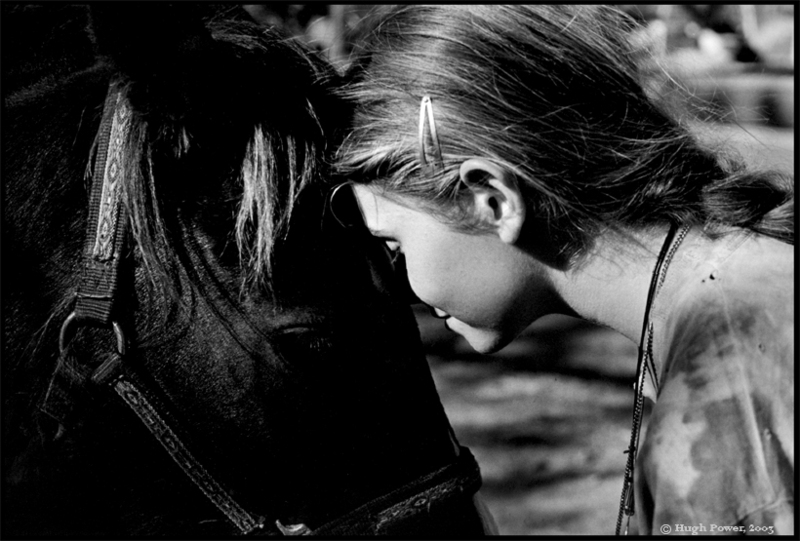 I’d trained that horse, ridden him many miles, to the point where we were not just horse and rider: we were friends. I knew what my Little Black Horse could do, and had faith he could do anything I asked him to do, be it jump to the moon or swim the ocean. Riding a NATRC ride would be a piece of cake. Some would say that the rest is history. Ferdie went Open his next ride, and after a few years earned his National Championship in NATRC. He now has over 1000 miles in NATRC competition. His accomplishments in AIHR are far too numerous to name, though he earned AIHR’s highest honor—the Supreme Hall of Fame Award—a few years ago. The parade and exhibitions he has done are ‘way, ‘way too many to name, including two appearances alongside Rowdy Yates at Breyerfest. But what’s really impressive is what he does for other people. Anyone can ride Ferdie, from a 4 year old to a delicate grandma. Even someone who can ride well can enjoy him. At this point in his life, he has probably taught over 200 people how to ride, and introduced some important people to Colonial Spanish Horses. But I know my Little Black Horse well still. Now 17 years old (and me now at 23 and concentrating on other horses), we both know full well his days of winning are far from done. Anytime there is an event we are participating in at Karma Farms, our client kids will literally get into fights over who gets to ride Ferdie. And just as he’s done for kids since I was one myself, the kid that rides Ferdie usually takes home a ribbon. But no matter how many people ride him, or how many awards he may win, or how well known he is or will become, one thing remains true between the two of us: we are not horse and rider. We are friends. What a wonderful story. God had his hand in Ferdie coming back to you. He is a wonderful, sensitive, loving horse and I knew that even back then. Tommi and Ferdie are truly a partnership, and one that I have been honored to witness at close hand since the beginning. The rapport of these two is just pure magic and one we who are blessed to love horses should all strive for. Here’s a wish for many more years of this friendship. Thanks to AIHR for allowing Tommi’s boy Fernando his moment in the sun. This fellow has been a real champion and promoter for CS Horses and Karma Farms for so many years now, and he’s still going strong. New kids are yet learning to ride on him every season the Great Spirit sends. We are blessed to have had the pleasure of his company in our Trail of Life.